In Christianity, an archbishop is an elevated bishop. The word comes from the Greek αρχι (archi), which means "first" or "chief," and επισκοπος (episcopos), which means "overseer" or "supervisor." While the bishops under his jurisdiction must follow the archbishop's orders on matters of church discipline, an archbishop is not superior to a bishop in sacred matters. Thus, when someone who is already a bishop becomes an archbishop, that person does not receive new Holy Orders or any other sacrament. However a person can become an archbishop without first being a bishop, in which case he must be ordained a bishop before being created an archbishop and installed. Traditionally, an archbishop leads an ecclesiastical province or a diocese of particular importance called an archdiocese. In ancient times until the Renaissance and beyond in some jurisdictions, the office of archbishop often involved substantial political power as well as spiritual authority. It was second in ecclesiastical prestige only to that of "patriarch," signifying an archbishop of one of the most important cities of the ancient Christian world, such as Rome, Antioch, Jerusalem, Alexandria, or Constantinople. The office of archbishop today exists primarily in the ancient Christian churches such as the Catholic, Eastern Orthodox, and similar traditions, as well as the Anglican Church. Only a few, usually small, other Protestant denominations also have archbishops. 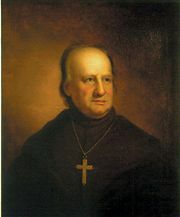 In the early Christian church, the office of bishop emerged from an increasing need for supervision, direction, and the resolution of disputes, both theological and ecclesiastical. In the earliest letters of Saint Paul, the offices of apostles, prophets, and teachers seem to have been the most important. Early sources also refer to elders and occasionally "overseers" (episcopi), although scholars dispute whether the authentic Pauline letters actually refer to the office we know today as bishop. The Book of Acts, however, indicates that James, the brother of Jesus, held central authority to resolve disputes at Jerusalem; and tradition holds that Saint Peter became the first bishop of Rome. By the early second century, bishops were clearly present in several Christian churches, although it is not certain that they ruled their churches singly. Indeed, there is evidence that in some cases these "overseers" acted as a board of elders, making their office similar to that of the presbyters. By the later second century the so-called "monarchical episcopacy" had begun to emerge in the "orthodox" churches as the bulwark of correct teaching authority against the threat of "heresy." On the other hand, many of the most important heresies of succeeding centuries were led by bishops of the most important cities of Christianity. Metropolitan bishops were first mentioned in the canons of the Council of Nicaea in 325 C.E. Meanwhile, the number of bishops had also multiplied. Country bishops—known as chorespicopi—were notorious for their lack of education and sophistication, and for their vulnerability to theological notions deemed heretical by their more sophisticated counterparts in the cities. The bishops of great cities naturally came to hold greater prestige and authority than their country brethren. To these were given the title of metropolitan bishop, and later "archbishop." The title of pope once belonged to several metropolitan bishops at once, being synonymous with that of patriarch. It is difficult to determine an exact date when archbishops, as we now use the term, were first appointed. Metropolitans were mentioned in the resolutions of the Council of Nicaea (325 C.E.) and by the Council of Antioch (341), which reads: "The bishops of every province must be aware that the bishop presiding in the metropolis has charge of the whole province." However, in this period the concept of metropolitan bishop was not carefully defined. For example, it was applied both to bishops of provincial capitals and to those who are now called "patriarch" and "pope." The precise term "archbishop" itself did not occur in its present meaning before the sixth century, although the office described by the term was already in evidence a century earlier. Archbishops soon became important figures in Eastern churches and would play a key role in the history of the Roman Catholic Church in its efforts to realize an effective administrative structure in far-flung provinces in "barbarian" Europe. The area of an archbishop's jurisdiction is termed an ecclesiastical province. Such jurisdictions first assumed a fixed form in the Eastern Roman Empire shortly after Christianity became the favored religion of the emperors in the fourth century C.E. The more important centers (Antioch for Syria, Ephesus for the Roman province of Asia, Alexandria for Egypt, and Rome for Italy) were regarded as the mother-churches of the newly-founded Christian communities. 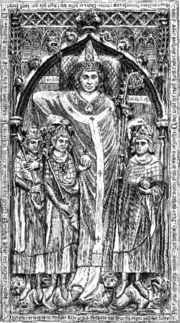 Archbishop Peter of Mainz, fourteenth century, vested with pallium of papal authority. 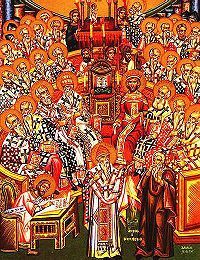 Earlier, from the second half of the second century, the bishops of various territories had been accustomed to assemble on important occasions for common counsel in synods. From the early third century onward, these increasingly important synods were usually called by the bishop of the capital of the state province, who normally also presided over the assembly, especially in the East. Important communications were also forwarded to the bishop of the provincial capital, whose greater staff and resources allowed him to coordinate communications with the other bishops. Thus in the East during the third century, the bishop of the provincial metropolis came gradually to occupy a certain superior position. At the Council of Nicea (325) this position of the metropolitan bishop was already taken for granted. In eastern canon law since the fourth century, each civil province was also a church province under the direction of the metropolitan—the bishop of the provincial capital. This division into ecclesiastical provinces did not develop so early in the West. In North Africa, the first metropolitan bishop appears during the later fourth century, the bishop of Carthage being recognized as primate of the dioceses of Northern Africa. After this, metropolitans of the various provinces gradually appear in the record. However, the boundaries of these ecclesiastical provinces did not coincide with the divisions of the empire. A similar development can be discerned in Spain, Gaul, and Italy. The migration of the "barabarian" nations, however, prevented a stable formation of ecclesiastical provinces in the West as in the East. In the West, it was only after the fifth century that ecclesiastical provinces gradually developed in accordance with the ancient divisions of the Roman Empire. In Italy, this development was even slower. Disputes often arose regarding the delimitation of church provinces, both between local bishops and between the papacy and the eastern patriarchs, especially the patriarchy of Constantinople, the seat of the imperial throne. Archbishops became important agents of the pope in resolving disputes between Rome and the western provinces, and archbishops thus became papal vicars entitled to wear the pallium, previously reserved to the pope. By around 600 C.E. the existence of church provinces as the basis of ecclesiastical administration was fairly universal in the West, as well as in the East. In the Carolvingian period, these provinces were reorganized in accordance with the realities of that present age, and have retained their place until now. In western Christianity, an archbishop is entitled several privileges that a simple bishop does not receive. First, an archbishop's coat of arms looks different. Roman Catholic archbishops are allowed ten tassels a side on their coat of arms, while a bishop only receives six. In addition, an archbishop can also place an archiepiscopal cross (two bars instead of one) behind his shield. In the Catholic Church such a cross used to be carried immediately before archbishops in liturgical processions, but this is not always the case today. In the Anglican Communion an archiepiscopal or primatial cross is carried before an archbishop in procession. Also in liturgical protocol, archbishops precede simple bishops. Catholic archbishops dress and are referred to in the same manner as a normal bishop. Exceptions occur in the Anglican Communion, where an archbishop is styled The Most Reverend while a simple bishop is styled The Right Reverend. Today, most western archbishops are called so because they are in charge of an archdiocese, a diocese of particular importance. This importance is usually due to the archdiocese being the metropolitan see (episcopal domain) of the ecclesiastical province in which the see is located. These metropolitan archbishops, in addition to the usual ceremonial privileges of archbishops, hold the responsibilities of a metropolitan bishop over the diocesan and auxiliary bishops within a metropolitan's province. Only archbishops are privileged to wear the pallium, an ecclesiastical stole originally reserved to the pope alone. If an archdiocese is particularly significant, the archbishop may become a cardinal. Sometimes, a diocese is an archdiocese because of its history or size and not because of its jurisdictional importance. Their archbishops, while retaining the ceremonial privileges of archbishops, act as normal residential bishops and usually are subject to another metropolitan bishop. Most of these non-metropolitan archdioceses are located in Europe, a few examples being the Archdiocese of Strasbourg, which is not in any ecclesiastical province, and the Archdiocese of Avignon, whose archbishop is under the authority of the Metropolitan Archbishop of Marseilles. A residential archbishop who resigns his see and does not take up another one retains the title Archbishop Emeritus of the last see he occupied before his resignation. This occurs when an archbishop retires or is transferred to some other non-diocesan office, such as the Roman Curia. This recent canonical innovation was instituted to conserve titular sees for active auxiliary bishops and members of the Roman Curia who have not had a diocesan appointment yet. In the past, the pope would normally bestow a titular see on every retired bishop and every bishop who transferred to the Curia. Finally, some archbishops hold their privileges ad personam. This means that the archiepiscopal dignity is conferred on them alone and not to their diocese. The primates of the Anglican Communion are this kind of archbishop, since they only hold archiepiscopal rights for the duration of their presidency. In the ad personam archiepiscopal privileges usually endure perpetually. 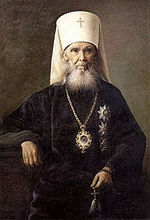 Makariy Nevskiy, metropolitan archbishop of Moscow prior to the Russian Revolution. In the Eastern churches archbishops and metropolitans are distinct, although a metropolitan may be referred to as metropolitan archbishop. While Orthodox priests are generally not required to be celibate, from about the sixth century, it has been the rule in the Orthodox churches that bishops and archbishops must be single men or widowers. They are normally drawn from the Orthodox monastic orders rather than the regular clergy. In the Slavonic and Antiochian traditions, a metropolitan outranks an archbishop. The reverse is true in the Greek tradition. The Oriental Orthodox generally follow the pattern of the Slavic Orthodox with respect to the archbishop/metropolitan distinction. The change in the Greek tradition came about relatively late in Greek Orthodox history, because the diocesan bishops of ancient sees were still called "metropolitans," even though their churches had diminished in importance, for example in lands occupied by the Muslims. 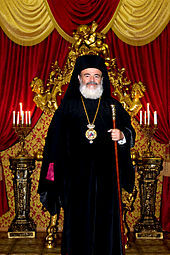 The Greek Orthodox Archdiocese of America is the notable exception in the Greek practice, with its diocesan bishops still carrying the title of metropolitan. A number of smaller denominations also use the term "archbishop," usually as a term of honor designating the person of highest authority in that tradition. This page was last modified on 26 October 2012, at 14:56.